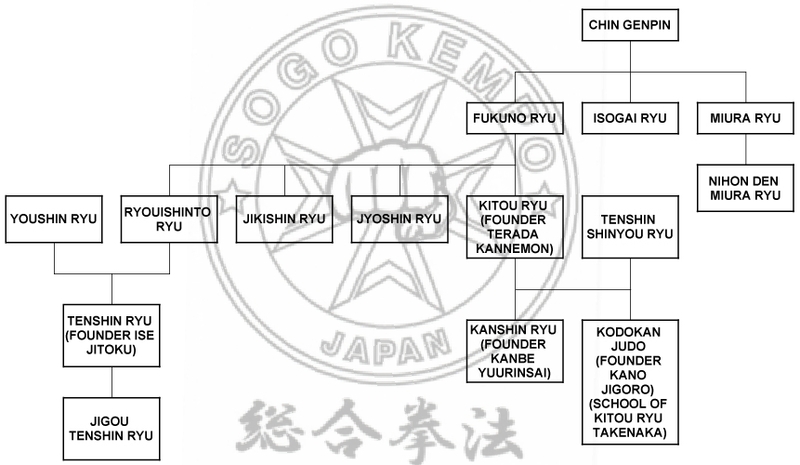 The history of Kempo as martial art begins in Japan during Edo period. Chinese master Genpin (born in 1587) transmitted his art, Chugoku Kempo, to the Japanese martial artists, between 1617 and 1627, influencing major Japanese schools (his picture was on the wall of the Kito Ryu Dojo in Okayama, Buyokan of Noda Gonzaburo, 1842-1917). -　Okayama Prefecture Judo History, 1958, publisher Yaichihyoe Kanamitsu. -　Obunsha Sport Series 16 Judo, 1956, author Yaichihyoe Kanamistu. The chart was in the works of Master Yaichihyoe Kanamitsu, Obunsha Sport Series 16 Judo 1956 and Okayama Ken Judo Shi 1958. According to the author, this chart was written in 1784 by Imahori Kichinosuke, the sixth successor of the Kito Ryu (School) from Noda Ha (Kito Ryu Noda). An important point is that Master Terada, the third successor of the Fukuno Ryu(School), was the one who changed its name to Kito Ryu. 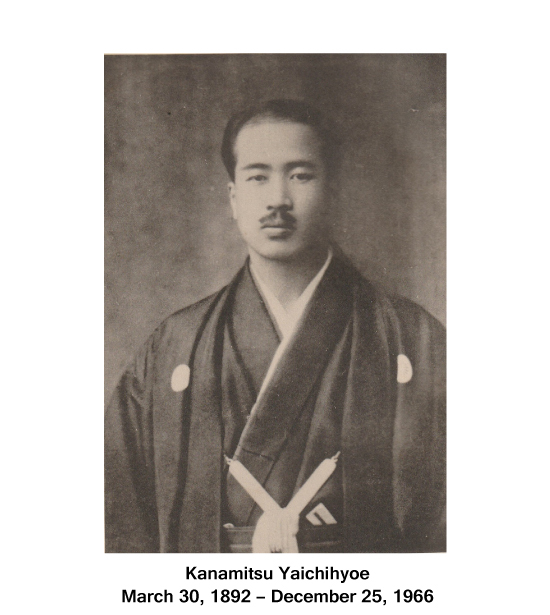 Yaichihyoe Kanamistu (born March 30, Meiji 25) was a hanshi, Kito Ryu (School) Noda Ha. His master was Kishimoto Jyutaro (Eighth generation, Noda Kyuma’s best student). 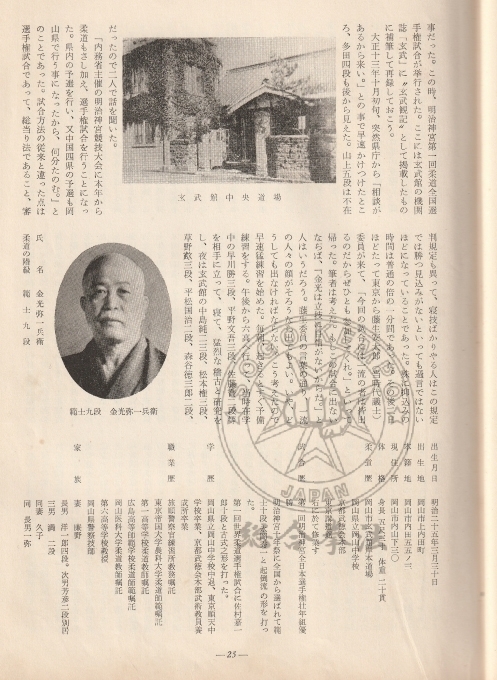 Another source that conveys the same information is the “Judo Manual”, which was used at Dai Nippon Butoku Kai, published in Taisho 13 / 1924, by Hajime Isogai, 10 Dan Kodokan. In the first chapter titled “The Origin of Jujutsu”, the author mentioned about Chin Genpin’s influence on Japanese Jujutsu and Kito Ryu Kempo. The techniques, crafted by great masters starting with Chin, Fukuno and Kanamistu, are at the heart of the SOGO KEMPO school. Master Yaichihyoe Kanamitsu, through the study and the teachings that he left, is the emblematic image for our school. In 2005, the founder of the SOGO KEMPO school, Mircea Sabou, arrived in Japan to deepen the study of nippon martial arts. He came with a background that included Judo, Karate, Aikido, European Boxing, European Kempo. He visited and trained in various schools and styles. In a short time, he found himself in the history and teachings of Master Kanamitsu Yaichihyoe. 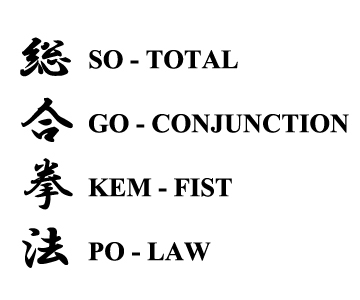 The fusion between Chugoku Kempo and Nippon Jujustu made by Master Fukuno, described by the Great Kanamitsu in his writings, became the basic inspiration for the formation of Sogo Kempo. After 2005, in the following years, Sabou conducted a study of the Fukuno Ryu / Kito Ryu fighting techniques, identifying and systematizing them. He found many of these techniques imported into other martial arts schools or sports combat. Keeping them as a lineage became his goal. This core became the basis of Sogo Kempo. Sabou synthesized elements from the European boxing and Tode as striking techniques / atemi waza. Defending / blocking techniques are characteristic of Sogo Kempo school, allowing best positioning against the opponent in performing SK techniques. 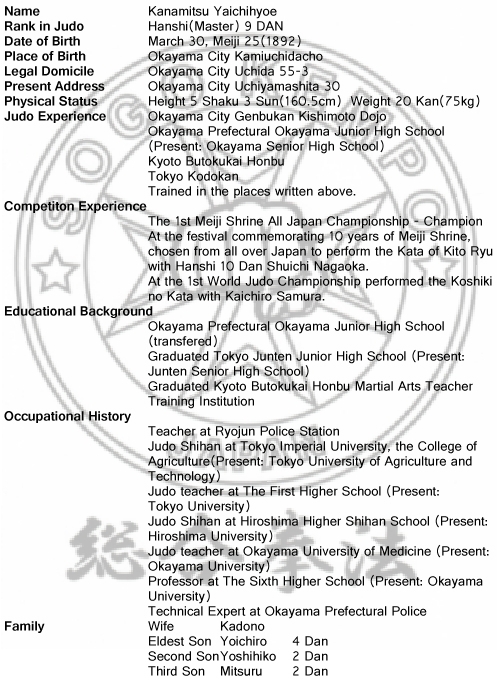 In 2009, the founder established himself in Japan and founded Nippon Sogo Kempo Kyokai. The same year, he opened the first Dojo in Ichikawa, Chiba ken. In 2011, Sabou decided to change his location to the Kansai area Japan. He lived and taught Sogo Kempo in Shiga prefecture, Kyoto until he settled in Hyogo ken, where he established the honbu Sogo Kempo.